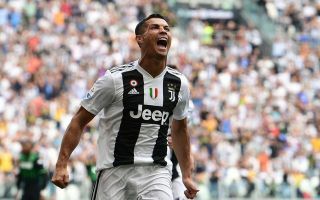 Superstar Cristiano Ronaldo finally got off the mark for Juventus in this afternoon’s match with Sassuolo at the Juventus Stadium. The forward silenced his critics by scoring a sensational double in only 15 minutes. Juventus weren’t able to score in the first half of the contest and fans wondered if the side could make a breakthrough. Just as fans thought it wasn’t possible up-stepped Ronaldo who fired his team into the lead. Ronaldo’s first came in the 50th minute when the former Real Madrid man poked home after a goalmouth scramble. It may have been one of the 33-year-old’s easiest goals of his career but it will certainly be one that Ronaldo cherishes for a long time to come. Ronaldo’s second was very impressive, former Liverpool ace Emre Can played a through ball into Ronaldo who produced a cool finish into the bottom corner with his weaker left foot. The Portuguese superstar will be delighted with his first two goals for the ‘Old Lady’. Ronaldo’s first goals in black and white come only days before the new Champions League campaign begins. Five time Ballon d’Or winner Ronaldo will definitely have put some of Europe’s biggest sides on notice after his goals this afternoon.